Fighting With the Filthy Thirteen: The World War II Story of Jack Womer - Ranger and Paratrooper by Jack Womer and Stephen C. Devito - Jimmie Aaron Kepler, Ed.D. Travel with Jack Womer from the steel mills of Dundalk, Maryland through his being drafted (which he resented) and assigned to the 29th Infantry Division to his deployment to England. Experience with him his selection to and the nearly yearlong training with the British commandos as a member of the 29th’s elite Provisional Ranger battalion. You will learn how he joined the 101st Airborne Division after the disbanding of 29th Ranger Battalion. You will meet the group of demolitionist he joined in the 506th Parachute Infantry Regiment’s demolition platoon as they fight in Normandy, Holland, the Ardennes and Germany. The detail of the combat jump into Normandy gives you the sensation of being there as well as showing the confusion on the group. Wormer shares examples how his Ranger training helped him survive in combat. Unfortunately, he does not share the same level of detail in the campaigns following Normandy. Co-author Stephen Devito did a great job of interviewing Wormer and putting his stories into a first person narrative. The book gives the feel of a veteran telling the actions of his youth. Wormer shares how he and other soldiers had girlfriends when in England, but his heart yearned to return to the United States and his fiancée Theresa. A side note I enjoyed was the story of how he asked Theresa for a new picture and she refused. He told the story of his desire for a replacement picture. The press picked up the story. The Baltimore newspaper carried the story. We see his fiancée Theresa’s response/reactions. 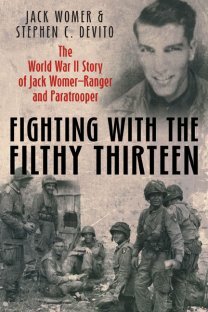 The book’s title “The Filthy Thirteen” is the nick-name of the section in the 506th’s demolition platoon that Wormer was assigned. It operated/used special equipment like flame-throwers and explosives to attack and clear German positions. These men were infamous for hard living, tough fighting, and poor personal hygiene that earned them their name. The claim is made that The Filthy was an inspiration for the film the Dirty Dozen. I recommend this well-written and interesting book.